Sproul looks at the main issues raised in Ephesians, including overcoming idolatry, God's sovereignty in ALL things and the importance of fellowship and commitment to the church for healthy spiritual growth. You'll be surprised at how freshly Paul's understanding of the Christian faith leaps off the page. 176 pages, from Christian Focus. About "Purpose of God: Ephesians"
Paul's Epistle to the Ephesians is possibly best known for its description of the 'Christian's Armour'. The letter is a reminder to the churches in Asia to live out their faith in the light of the redemption unveiled by God. It is a section of scripture that has lastingly influenced many believers throughout church history. R.C. Sproul looks at the main issues raised in Ephesians. These include how to overcome idolatry, God's sovereignty in ALL things and the importance of fellowship and commitment to the church for healthy spiritual growth. 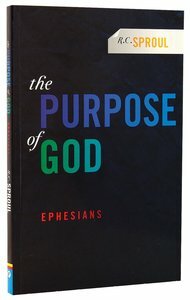 There are many areas in the epistle, which have occasioned real dispute in the Christian church, and these are dealt with in Sproul's customary style - deeply profound and the ability to communicate illuminating truth. You will be surprised at how freshly Paul's understanding of the Christian faith leaps off the page.